It did not go unnoticed to WMS that wild prairies combined with large hoofed animals can make for a popular theme. 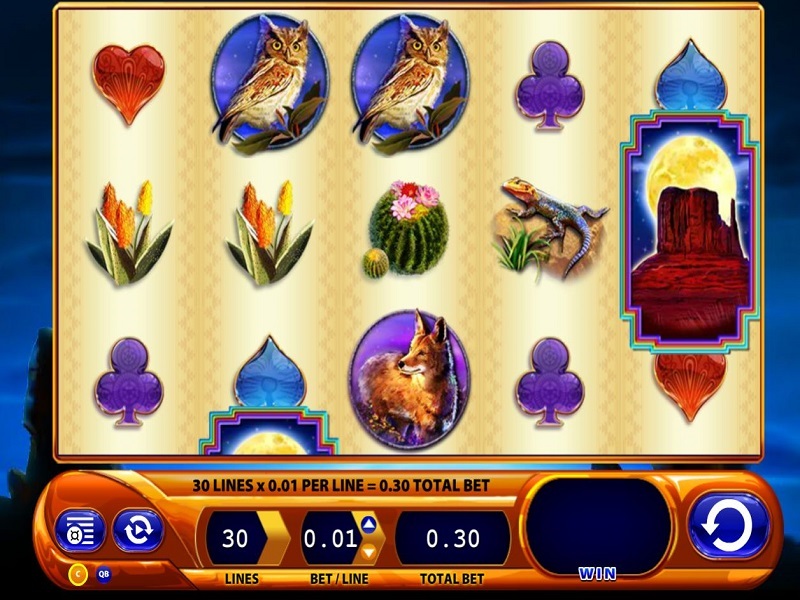 Buffalo Spirit video slot brings together western wildlife, such as foxes, cactus, lizards, mountain ranges and more. Like many WMS slots, Buffalo Spirit has 30 paylines over a 5×3 grid. The format is popular and has been used on many other slots in their portfolio. Once again the Buffalo is the main attraction here, look out for it on the middle reel for replicating Wilds. Try Buffalo Spirit for free here and you will get a feel for the game before playing for real money. We recommend this on all Buffalo slots, including Legend of The White Buffalo and Buffalo Thunder. If you’ve played Aristocrat’s Buffalo, with its wide array of wildlife, you’ll know that the buffalo symbol features prominently. Well, the buffalo takes centre stage again in developer WMS’s Native American-themed slot, Buffalo Spirit. And if you’re keen on the buffalo stance, the progressive jackpots in the game are equally enticing. The online version of a popular land-based slot, Buffalo Spirit is a 5-reel game with 30 paylines. As you’d expect with its Native American theme, animals feature prominently. The buffalo is ably supported by a cast of wild beasts including eagles, foxes, lizards, snakes and owls. Slightly less spiritual – but no less striking – are the cactus and card symbols. Did we mention that the buffalo plays a key role in Buffalo Spirit? Yes? Good. Well, the buffalo acts as the Wild. Our furry behemoth substitutes for all other symbols other than the Scatter (the rock). In fact, not content with one buffalo Wild, WMS have installed a second buffalo Wild into the game. Wild 1 – the buffalo inside a square frame – appears on Reels 1, 2, 4 and 5, whereas the second buffalo Wild – this one is inside an oval frame – appears on the third reel. He’s rather special, as when he completes a winning payline he’ll trigger a Replicating Wild feature. The symbol it replicates will be taken off the reels and replaced with Wilds. The feature ends once any winnings have been calculated. Remember the Rocky Scatter? Get three or more of those bad boys on the reels and you’ll trigger free spins, with 40 up for grabs if you get five Scatters across the reels. All wins are doubled during the Free Spins feature. I personally think this is a very enjoyable game, but a seasoned player will instantly detect that it has a very similar game engine to another WMS slot, Dragon’s Inferno. This sort of takes the icing off the cake a little, from an otherwise very entertaining video slot. This short video of the Buffalo Spirit video slot should give you some interesting details about how this slot works. It also describes all the key features of the game and the main opportunities to win. To get a full understanding of Buffalo Spirit it is recommended that you take a few minutes to watch it through.